Jesus Christ, the same yesterday, and today, and for ever. Puritan preachers meditated on this text using a circle, which may be distinguished into a centre, a circumference, and a line connecting them which is Semper idem, "Always The Same". Jesus Christ is the immovable centre. The circumference is eternity. 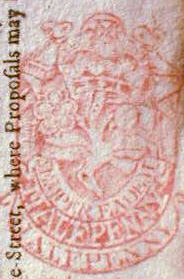 During the reign of Queen Anne (1702-1714), crimson tax stamps with the motto Semper Eadem were applied to British newspapers. They added a halfpenny to the price of such papers as the Spectator of Addison and Steele, the Tatler, or the Examiner. The readers of these newspapers in the coffee shops of London may have wondered whether the halfpenny surcharge would be "always the same", as they discussed whether justice ought to be "the same for everybody" and not preferentially applied, or "graduated," or otherwise gratuitously and minutely varied. Semper Eadem was also the motto of the first Elizabeth and contains the notion of constancy and avoiding any kind of surprise, fear or favour. Elizabethan government continued the ways things had always been done, since time immemorial. Elizabethan poor law, exploration policy, and patronage of the arts was combined with avoiding debt whenever possible and keeping taxes down. Semper Eadem was one of the mottos of Anne Boleyn and may have evolved from the earlier Semper Fidelis, which survives as a motto of the United States Marine Corps. "Always faithful" - to God, to our country, to our countrymen; to our family and friends; and especially to our fellow warriors in the trenches; faithful to the true, the beautiful, the good; faithful "unto this last." Semper was the motto eventually adopted by Cosimo de' Medici to steer a course between conflicting aspirations of power and security, earthly wealth and paradise. Brunelleschi completed the dome of the Basilica di Santa Maria del Fiore in Florence in 1436 with Medici patronage. A remarkable feat of design and engineering, this dome marked the recovery of building technology lost after the fall of Rome. 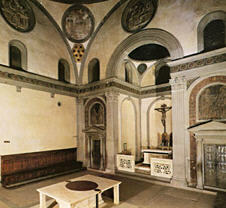 Filippo Brunelleschi had previously designed the Sacristy of San Lorenzo, which was constructed entirely under his supervision, commissioned by Giovanni di Averardo de'Medici (father of Cosimo) and dedicated to St. John the Evangelist. This manifestation of Renaissance architecture was based on the harmony between the two most basic geometric shapes: the circle and the square and the antique ideas of rhythm and measure. Various numbers of circles have been prominent on Medici family crests 12, 7, 8, 5 or 6. There has been considerable historical speculation about the origin of these circles from medicinal pills (or cupping glasses) that recalled the family's origins as apothecaries to bezants, Byzantine coins. They may have been inspired by the arms of the Arte del Cambio (the Guild of Merchant Bankers and Moneychangers to which the Medici belonged).